As birds of the night and prey, the owl symbol has been associated with psychic powers, the angel of death and the goddess of night. Owls represent spiritual influence, wisdom and knowledge in Greece, Rome, and in Celtic mythology while in Africa the owl is associated with witchcraft, wizards and sorcery. In Eastern Africa, the owl is seen to bring illness to children while Zulus in southern Africa sees the owl as a bird of sorcerers. Others consider it a messenger of wizards and witches and it always gathers witches and dances on the graves of the dead. As a nocturnal creature this bird symbolizes inner-knowing, psychic ability, and intuition, it is considered by many cultures as a messenger between earth and the heavenly spirit. The owl is still considered a witch's companion because they share unique spiritual communication, the same secret powers of the night and witches use them when calling other witches. 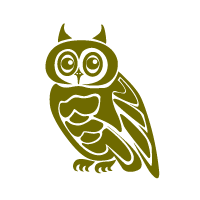 In the recent world, the owl symbol is used to symbolize education and it is often graduation mascot. Many cultures associated owl with the following: intelligence, brilliance, wisdom, power and knowledge. This bird has a gift of heightened senses which enables it see through deception, illusion, external appearances and to find hidden truths. People who have drawn owls symbols are said to have the same ability to uncover secrets. People will tend to be uneasy around you because they assume that you are able to see through them. The bird teaches us to accept the dark side of our personality and that we can always find food in the darkness.